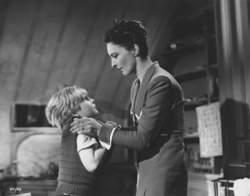 Between 1947’s Odd Man Out and 1949’s The Third Man, the great British filmmaker Carol Reed made this tiny gem of bewilderment, childhood perception and very adult deceptions. The Fallen Idol was the first of three collaborations between Reed and Graham Greene (The Third Man and 1959’s Our Man in Havana were the other two) and in terms of sheer minutiae of detail and sublime orchestration at work here there are few films of the period its equal. Adapted from his own minor novella work The Basement Room, the film is set in the divisive world of London’s Embassy Row in the early post war years. As in Basil Dearden’s The Blue Lamp, London is presented as a deserted dichotomy of wealthy piles and smoky working class cafes. It is in this world that lonely eight year old French ambassador’s son Phillipe (the immensely annoying but well cast Bobby Henrey) spends his days wandering the rooms of the Embassy and listening to the big game hunting stories of the beloved butler Baines (Ralph Richardson), but when Phillipe stumbles upon Baines’ little secret he comes to believe that his hero may be guilty of murder. The Fallen Idol is the epitome of the kind of elegant, eloquent, slow building storytelling that really is something of an anathema today, and as such it may be a bit of a stretch for a modern viewer but stick with it and the pay offs is tremendously satisfying. That fine stage actor Richardson rarely bettered the work he did here in cinema and Georges Perinal’s outstanding monochrome photography is simply breathtaking, but best of all Jack Hawkins as the bemused, suspicious but intensely class conscious Detective Ames makes one yearn for a simpler time of law enforcement.